“Written, directed and produced by Oscar-nominated filmmaker Asghar Farhadi, this riveting tale of love, revenge, and forgiveness stars Taraneh Alidoosti and Shahab Hosseini as a young married couple living in Tehran whose lives and relationship are forever altered by an unexpected act of violence... After their old apartment becomes damaged, Emad (Shahab Hosseini) and Rana (Taraneh Alidoosti), a young couple living in Tehran, are forced to move into a new apartment. However, once relocated, a sudden eruption of violence linked to the previous tenant of the new home dramatically changes the couple’s life, creating a simmering tension between husband and wife.” That is the official description for The Salesman, now available on Blu-ray, DVD, and Digital HD from Sony Pictures Home Entertainment, which has provided NewTechReview with a NFR copy for review. It’s unfortunate that the bright lights of Hollywood blockbusters often blind us to some of the very deserving foreign films out there. Of course, there’s also the fact that many American viewers don’t want to give foreign films a chance because they are not familiar with the culture and language, and they have to deal with reading subtitles, which can sometimes take away from the enjoyment of a film. Even so, filmmaker Asghar Aarhadi has been flourishing with his directorial skills in features like The Past, A Separation, and now The Salesman. Fans of Arthur Miller’s Death of a Salesman will very much appreciate its influence on The Salesman. The young married couple in the film, Emad and Rana, are both amateur actors who are working together on a production of the aforementioned play, when their lives take a turn for the worse. After having to move into a new home (previously occupied by a prostitute), one day Rana is attacked by a home invader. She later awakens in the hospital with a bad head wound and memories of the brutal assault. When Rana returns home, she is a different person... upset, afraid, and withdrawn, which puts a major strain on the marriage. At the same time, Emad is hell-bent on finding the attacker and seeking revenge. 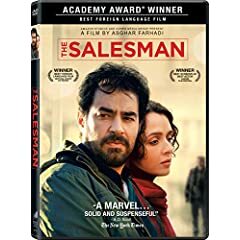 Rather than pursuing the possible violent side of the story, The Salesman explores the emotional turmoil between the married couple. It draws you into the story by showcasing the daily lives of Emad and Rana as they try to deal with what has happened to them. Farhadi has crafted the film so that each scene provides a significant part of the story, flowing from one idea to the next, and gives the viewer a deeper understanding of what the couple is going through. Unfortunately, we’re only provided with a single bonus feature: A Conversation with Writer-Director Asghar Farhadi. This is a featurette that includes Farhadi discussing how the film was written and made, how various scenes were structured, and the process he used. He also talks about the cast, their performances, and their interactions on-screen. Already proven to be a talented writer and filmmaker, Farhadi has once again delivered an excellent storytelling experience with the Oscar-winning The Salesman. It’s unfortunate that it takes winning an Oscar to bring attention to this film, as it provides an emotional and telling look into the human condition. Fans of foreign cinema will definitely enjoy it, and anyone who wants a break from the flash of most Hollywood blockbusters will enjoy it as well.